Beaming family and friends looked proudly on from within the glittering ballroom in Aberdeen’s Hilton Treetops hotel yesterday as their loved ones graduated from the North East of Scotland College. A capacity crowd filled the venue and they gave rousing cheers and applause as the scores of graduates crossed the stage to receive their awards. 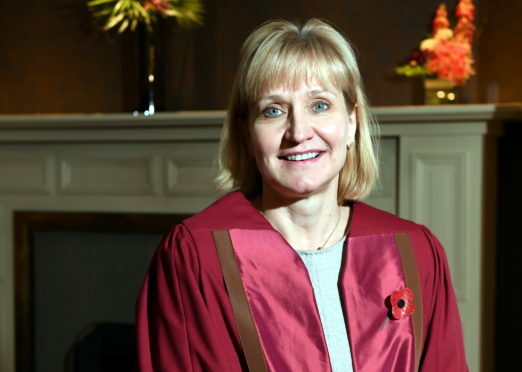 This year the college honoured Oil and Gas UK CEO Deirdre Michie OBE with its Fellowship Award, one which she said she was “chuffed” to be receiving. Addressing the audience, Mrs Michie said it was a “real privilege” to have been invited along. She spoke of her own learning story and gave some advice to the graduates, urging them to forge ahead to continue “writing their own story”. She said: “This is a really special time as you reflect on your achievements and look to see how you can build on them – with a great qualification from an excellent college – irrespective of the stage of life or career you are at – you have made such a positive step from which you can continue to grow. “Go out there and start networking, I don’t mean online, but in the same room – face to face. Speaking of the renewed positivity within the oil and gas sector she described it as “not a sunset industry” and said she would like to see more companies investing in modern apprenticeships. She added: “We have seen the number of apprenticeships go up in the Oil and Gas Technical Apprentice Programme – I think that is evidence of us coming out of the downturn. “I think some have realised they should have been investing during that time – but today is a positive celebration of a lot of that. “I’m really chuffed to be getting this – the excitement in the room is wonderful – it’s such a positive event.